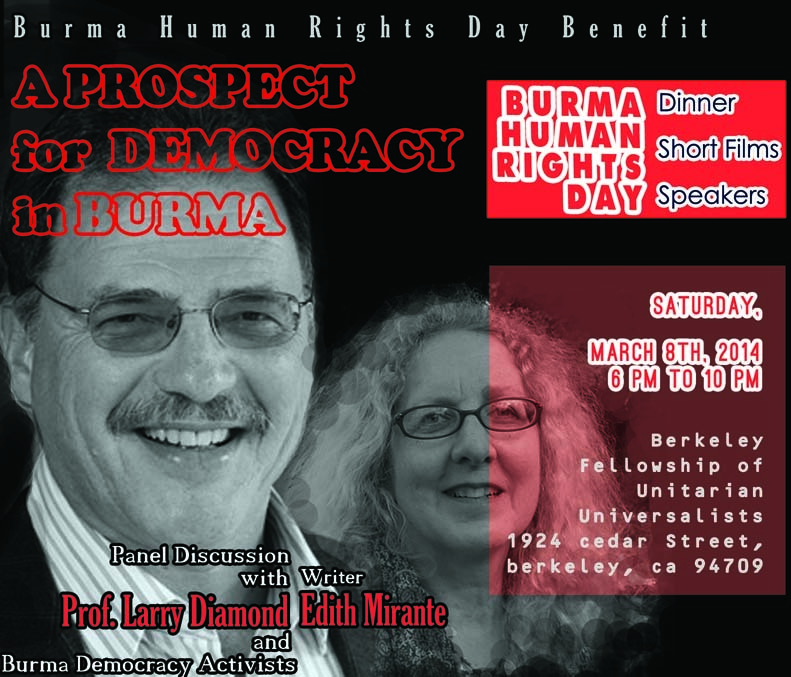 To commemorate the 2015 Burma Human Rights Day, you are cordially invited to join a round table discussion with activists, organizations and community members to discuss our views on the situation in Burma and how we can continue to support positive changes there. With the election less than eight months away, so much is going on in Burma. Among other things, a new generation of student protesters is emerging and fighting to change the unjust education laws. The government has now begun to crack down on them as they have done to the garment workers, farmers (land-grab victims) and media. The round table discussion is to be moderated for effectiveness, and the key topics of the discussion are (but not limited to): Reforms, constitutional amendments, 2015 elections, peace and reconciliation, protests, land grabs, and the current human rights situation. 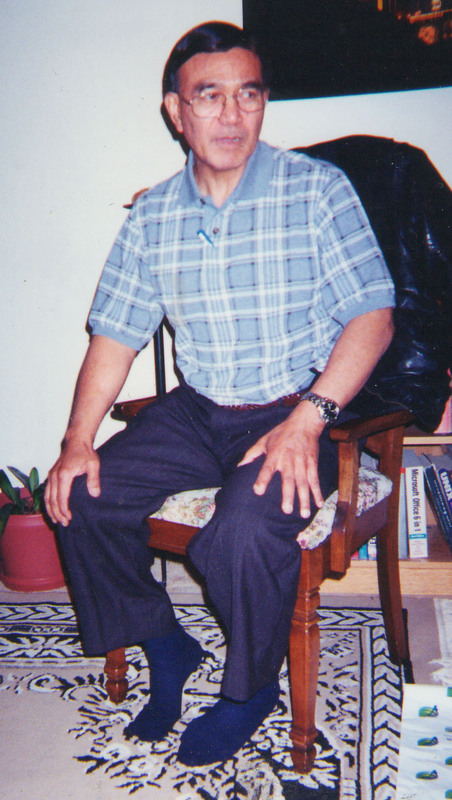 Our longtime supporter of Burma's democracy movement and groups around the world -- including those in the San Francisco Bay Area -- Dr. Aung Khan (A Physician) has passed and we are doing a one month ceremony of his passing in the Bay Area according to the below program. It has been a great loss to us and you are cordially invited to join in. A flyer is attached for more information and please help distribute it to anyone who might be of interest. 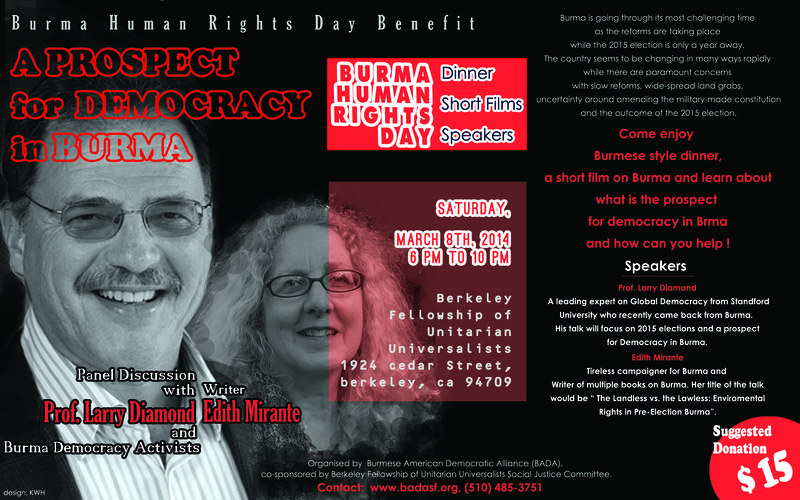 Come enjoy Burmese style dinner, speakers, a short film on Burma and a panel discussion with Burma experts and activists. Burma is going through its most challenging time as reforms are taking place while the 2015 Election is only a year away. Through the country seems to be changing, the people's livelihood is no better and they are as always struggling for their daily survival. There are paramount concerns with slow pace of reforms and peace process, wide-spread land-grabs, continued human rights abuses, cronyism, uncertainty with amending the Sham constitution and the ultimate outcome of the 2015 elections. Though Daw Aung San Suu Kyi is pushing hard for the constitution amendment, it is going no where and we may all end up legalizing the military rule further as the constitution is designed to do and the international community might just give up to pressure further after 2015 elections. 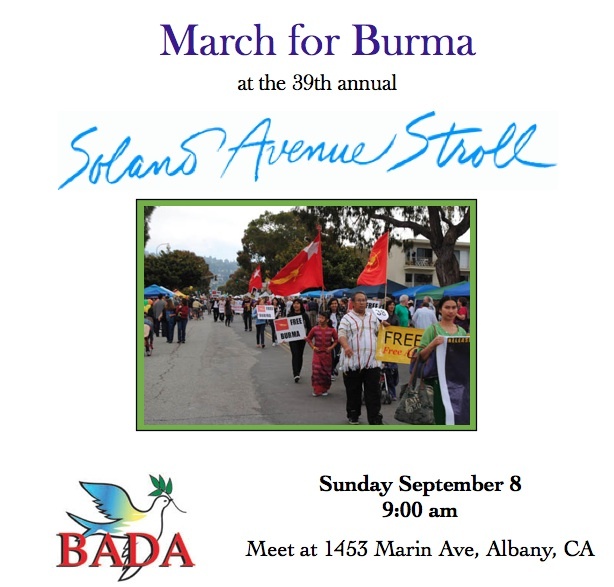 Therefore, now is the most crucial time for Burma and her people and come join us to learn about how you can help for the better there. Please receive the attached flyer for the San Francisco Bay Area Annual Burmese Literary talk with first time Speakers / Writers: Song Win Latt, Maung Kaung Myint and Maung Soe Chain. Join us for the Dinner, Speakers and Question and Answers on Burmese Culture and Literature should your schedule permits. Please also forward this invite to those who might be interested. 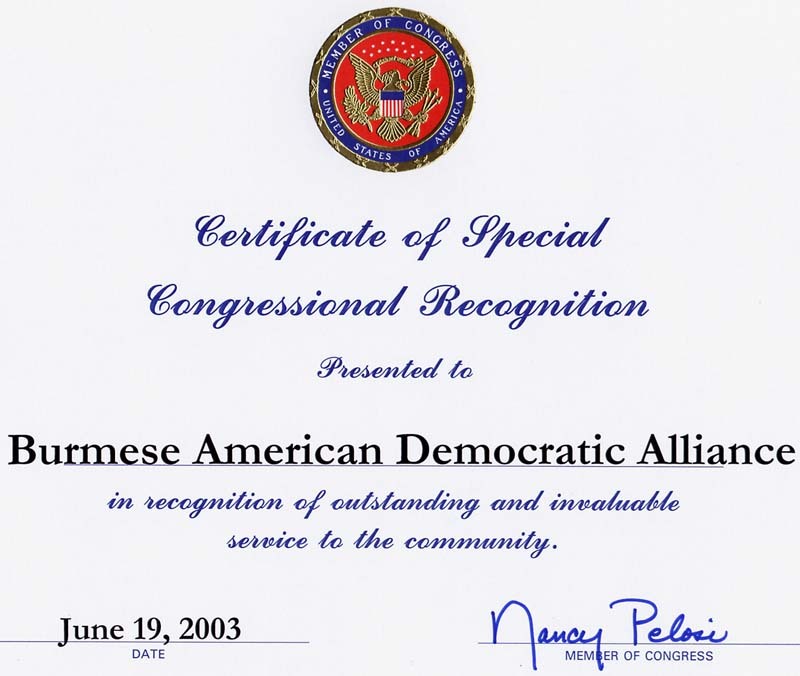 The Burmese American Democratic Alliance (BADA) has public charity, nontaxable, 501(c) (3) status in the United States. We are a non-endowed organization and rely on the annual support of many generous individuals, foundations, and corporations.